The vegetation in Group 1 was dominated by Fontinalis antipyretica (78% of the sites), Nuphar lutea (70%), and Sparganium emersum (70%). In Group 5 the dominant species was Nuphar lutea, which was present in 86% of the sites. Alisma plantago-aquatica, Elodea canadensis, Nuphar lutea, Sparganium emersum, and S.
Among the floating-leaved plants, Nuphar lutea and Nymphaea alba were most widely distributed along the western shore of L.
Nymphaea alba, Potamogeton praelongus, and Nuphar lutea (Table 2). 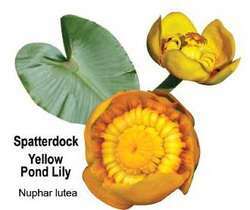 Only a few seeds of Nuphar lutea were found at three points: JM1 (D 1.